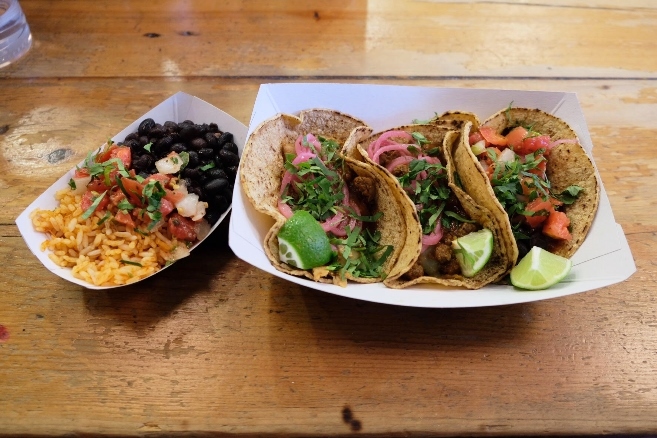 Named for the Mexican city known for fantastic food, Oaxaca Taqueria has come to be known as a restaurant chain that delivers excellence in the NYC metro area. Recently, to build upon a sustainable purview of making fresh, largely-locally sourced food from scratch each day, Oaxaca founder Dave Schneider has evolved the menu to include vegan options thanks to plant-based proteins provided by ‘Beyond Meat’ (the vegan meat company working to reduce global warming through a sustainable food supply, backed by Bill Gates). The Mexican street food inspired menu continues to include Burritos, Tacos, and Platos with the essential carnitas, shrimp, chicken and more to satiate carnivores – but now also offers all of the same with deeply seasoned “pollo” or “carne.” Of course, you can still get your favorite vegetable standbys: papas y rajas or frijoles negros. And yes, they look, taste and feel like the real thing. Highly recommended is the “pollo” Burrito [$6.95 for a small; $8.50 for a large] and the 3-Taco Combo [$14.50 for any 3 tacos w/ rice and beans] so you can mix and match to get your perfectly protein-balanced Mexican meal. With locations sprinkled throughout Manhattan and Brooklyn, you can now easily get your vegan-Mexican fix. And, although we’re admiring the new plant-based meats, don’t forget to stop and appreciate the pickled red onions.